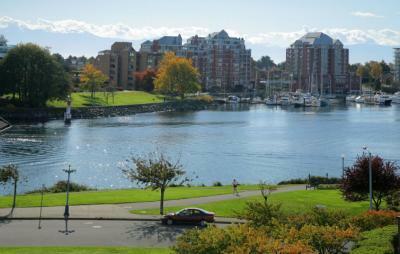 Enjoy relaxed city living only footsteps from the sea in this delightful Songhees residence featuring spectacular Harbour and Olympic Mountain views. Offering an appealing mix of downtown convenience and uptown calm, this desirable neighbourhood is just a lovely ocean-side stroll away from Victoria�s full complement of fantastic amenities. The spacious floor plan of this address affords a gracious ambiance seldom found in condominiums of this price point. At 1,447 sq.ft., with two beds, two baths and a den, this well kept suite is large enough to be a great family home. A Southern exposure ensures bright and uplifting natural light throughout the year, while a sunny 116 sq.ft. covered view balcony provides room for outdoor leisure without the hassle of yard-work. Pleasing details include, a spacious entry, a sitting room with gas fireplace adjoining the living room, casual and formal dining areas, a washer and dryer, and French doors in the master that open onto a Juliette balcony.